Gianina G. Knoth is a licensed acupuncture physician and has been writing professionally since 1995. Her work has been featured in national television and print campaigns, including the "The New York Post" and "Sun-Sentinel." She holds a Bachelor of Fine Arts from the School of Visual Arts and a Bachelor of Science and a Master of Oriental Medicine from the Atlantic Institute of Oriental Medicine. Grape leaves, a popular staple of heart-healthy Mediterranean cuisine, are rich in vitamins and minerals. Grape leaves are often to be found canned or bottled, while raw or fresh grape leaves are best consumed after they're steamed or blanched. A popular Greek dish called dolmas uses grape leaves as a wrapper for rice, onions and meat. The U.S. Department of Health and Human Services lists grape leaves on its suggested shopping list based on the healthy dietary guidelines for Americans. For those watching their weight, grape leaves are very low in calories -- about 14 calories for every five leaves. For general health and wellness, grape leaves are a good source of nutrients, including vitamins C, E, A, K and B6, plus niacin, iron, fiber, riboflavin, folate, calcium, magnesium, copper and manganese. A single heart-healthy serving, or one cup of grape leaves, has no fat or cholesterol and is very low in sodium and sugar. Grape leaves are mildly anti-inflammatory based on a rating system that estimates the inflammatory potential of foods and food combinations. Chronic inflammation is may cause certain illnesses and diseases, such as heart disease, many types of cancer and Alzheimer's disease. Other diseases that are a result of inflammation include arthritis and many gastrointestinal diseases, such as Crohn's disease. While lifestyle and genetics contribute to chronic inflammation, maintaining a diet that is healthy and low in inflammatory foods is the best strategy for containing it and reducing long-term disease risks. A single serving of grape leaves is full of nutrients and has a low glycemic load of 1. Monitoring one's glycemic load is important, especially for diabetics, since it measures the effect of food on blood-sugar levels. A daily total glycemic load target for the average, healthy adult is 100 or less, making grape leaves a healthy choice. Individuals with diabetes or metabolic syndrome should aim for a lower number. According to a 2010 study conducted by the Department of Dermatology at the University of Freiburg, plant extracts from grape vine leaves reduce edema in patients with chronic venous insufficiency. This is a condition characterized by veins that have problems returning blood in the legs back to the heart. When blood cannot return to the heart, the legs may swell, causing edema. A reduction of edema will not only make the individual more comfortable by reducing the swelling, but it will also cause less of a strain on the vascular system. 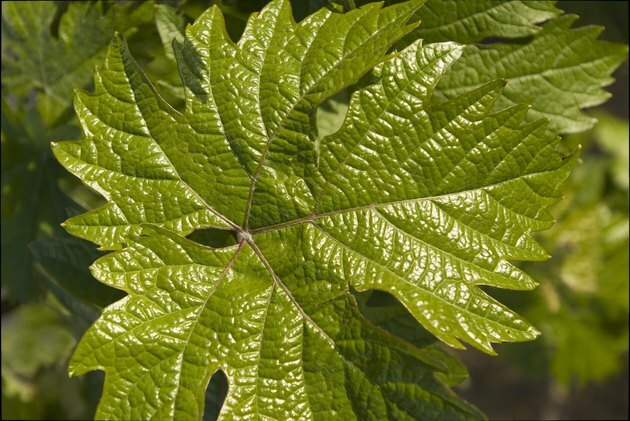 Grape leaves have been used for centuries and are still used in herbal applications, particularly red grape leaves. Other uses for grape leaves include the treatment of diarrhea, heavy menstrual bleeding, uterine hemorrhage, canker sores and excess vaginal discharge. Native Americans made grape leaves into a tea for diarrhea, hepatitis, stomach aches and pains and thrush. They used wilted grape leaves for sore breasts, rheumatism, headaches and fevers. While grape leaves have a history of being used for a wide variety of conditions, more research is needed to determine true efficacy. Thoroughly wash raw grape leaves before consumption. If you use bottled grape leaves, rinsing them before use will remove some of the excess sodium. Talk to your doctor before making any dietary changes or before starting a new diet. Partnering with your doctor is the best way to stay healthy, achieve weight loss or improve your health. Dietary changes, even healthy ones, should never be used as a substitute for the care provided by your doctor.